The legend goes like this: a Japanese shogun broke his favorite Chinese tea bowl, and sent it back to the same artisans who made it for repair. The bowl came back properly repaired with glue and metal staples. The shogun could not believe his eyes: ugly staples connecting delicate pieces of porcelain – surely that was not the right way to do it. 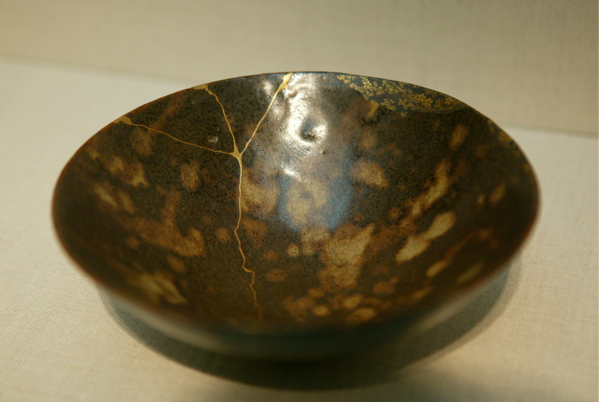 In response Japanese artisans invented kintsugi: a technique of repairing broken pottery with special gold-containing laquer resin. Pieces repaired in that way became even more beautiful and valuable than when they were whole. 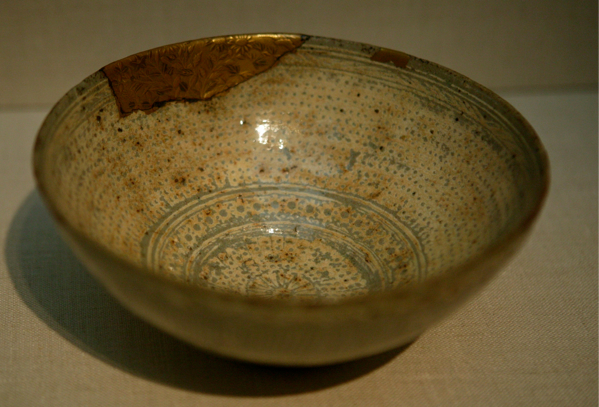 After seeing a few repaired pieces in museums I have no doubdt that the story about wealthy Japanese breaking their favorite tea bowls on purpose just to have them repaired is true. These two bowls were on display in a museum somewhere in Washington. I recently purchased this Karatsu tea bowl. It was excavated from an old kiln and is estimated to be of the 1570-1620 vintage. It was repaired by a modern craftsman using a similar technique called doutsugi which uses a gold-copper alloy. It cost me about $180. Is it authentic? Probably – the dealer seems to be reasonably reputable. I’ll greatly enjoy drinking tea out of it. This (as it’s often the case) made me think of my own craft. A huge part of my job is putting software Humpty Dumpties back together. Is any of my work this elegant? Of course not, but I can think of some examples. Apache – or “a patchy” comes to mind. It’s a beautiful piece of code glued together with other beautiful pieces of code. Then there’s Pressflow – a fork of Drupal that glued it back in many places where the original was cracking.